This includes Cable Terminations, Cable Joints, and Cable Accessories across a complete range of Heat Shrink and Cold Shrink Cable Jointing and Termination Kits. 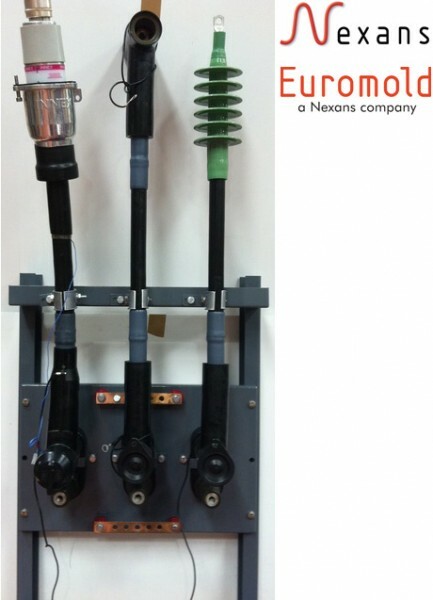 This scope of supply also encompasses the high quality range of Euromold Separable Connectors and Equipment Bushings across voltage levels up to 42kV. Our portfolio of Nexans Cable Terminations now includes a range of pre-terminated cable leads for MV Onshore and Offshore applications up to 52 kV. These excellent quality pre-terminated leads are an ideal solution for various applications can be utilised such as transformer to switchgear links, switchgear to array cables, in addition to testing of equipment. This saves valuable time on site and provides a dependable cable termination solution. Nexans are world leaders and have extensive knowledge of both cables and cable terminations which means they are able to provide single core XLPE and highly flexible cable options which incorporate Inner and Outer cone separable connectors, along with interference fit, cold-shrinkable and heat-shrinkable terminations. Nexans already supply a number of high profile customers with pre-terminated medium voltage cable connection leads who have identified the considerable installation benefits of this range of medium voltage cable terminations. These innovative, time saving, and cost saving pre terminated cable leads from Nexans are suitable for onshore and offshore applications. In offshore applications these pre terminated leads can help reduce time spent preparing and testing cables, therefore saving on installation time spent in the tower and also there is less reliance on weather conditions. In onshore applications the pre terminated leads provide a plug and play system for linking together equipment which means that OEMs are able to use these leads for testing purposes.